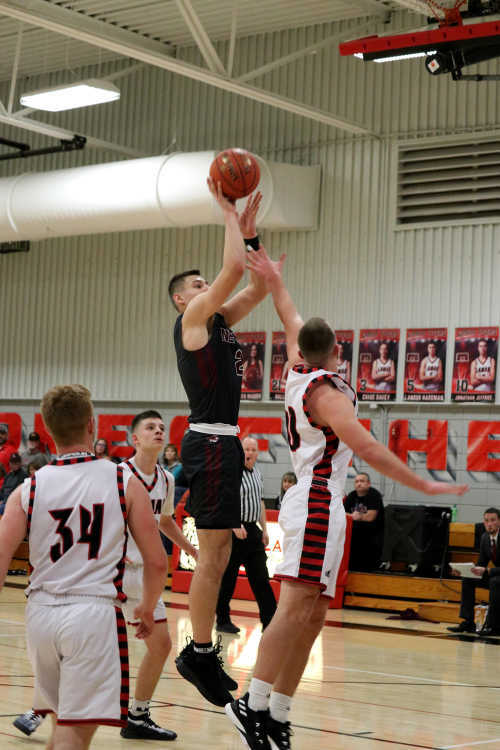 Nevada High forward Dalton Gayman drops in two of his varsity career-high 24 points Tuesday night. 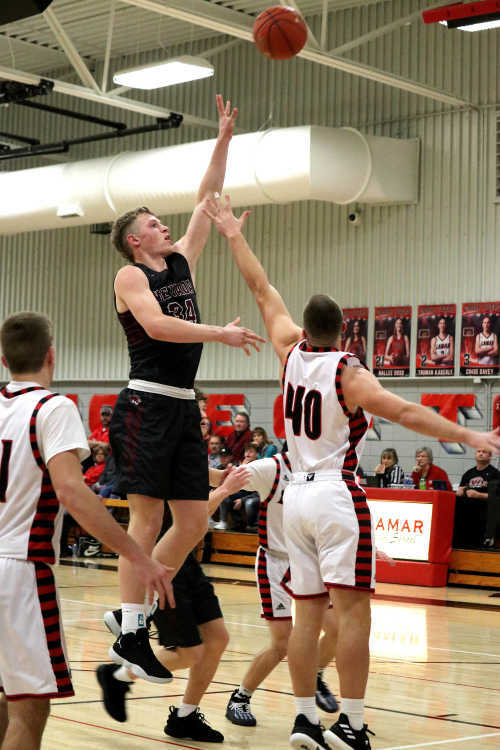 A 16-0 fourth quarter run resulted in an emphatic 67-49 victory for the Nevada High School boys basketball team over Lamar Tuesday night. The Big 8 Conference West division road victory moved the Tigers to 7-5 overall and 1-0 in Big 8 West play. Nevada led 16-14 at the conclusion of the first quarter, as NHS power forward Dalton Gayman poured in 11 points in the opening frame — which included a 9-of-10 performance from the charity stripe. The contest remained tight, as Nevada held a slim 31-29 advantage at the break, and led 49-46 entering the fourth. Nevada then blew the doors of the contest in the final stanza, outscoring Lamar, 18-3, accounting for the final 18-point margin of victory. Gayman’s breakout performance included 24 points and 12 rebounds, as the 6-foot-6 junior collected his second consecutive double-double. Nevada sophomore sharpshooter Logan McNeley releases a three from the right wing Tuesday. 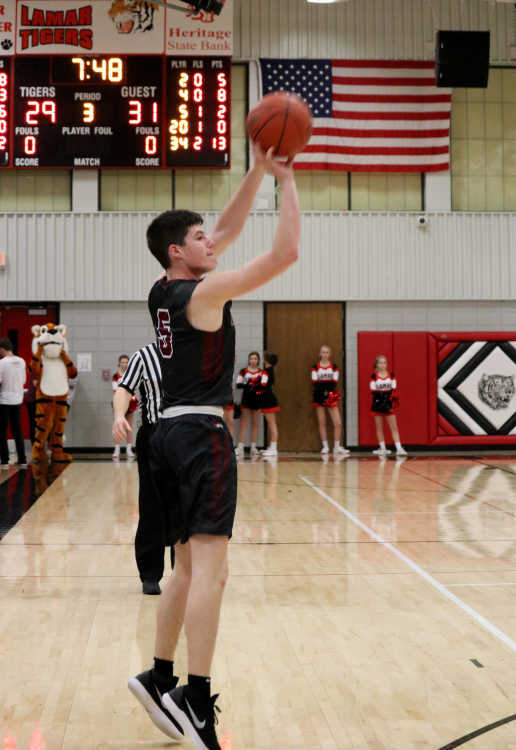 In addition to Gayman’s dynamite offensive production, Thompson (13) and Applegate (12) joined the double-figure scoring club, while Logan McNeley, picture above, chipped in nine points. In the junior varsity contest Nevada was defeated 40-19. Nevada also fell in the freshman game, 50-16. Nevada wing Matt Thompson elevates for the jumper Tuesday. Nevada returns to the court Friday, for a Big 8 Conference West division clash with East Newton High School. Tip off is slated for approximately 7 p.m.